The flight of a starling flock at dusk, known as a murmuration, is one of nature’s most beguiling sights. Blurring the line between the individual and the group, murmurations involve synchronised swooping patterns to ward off predators and exchange information in a manner that’s still something of a mystery to scientists. 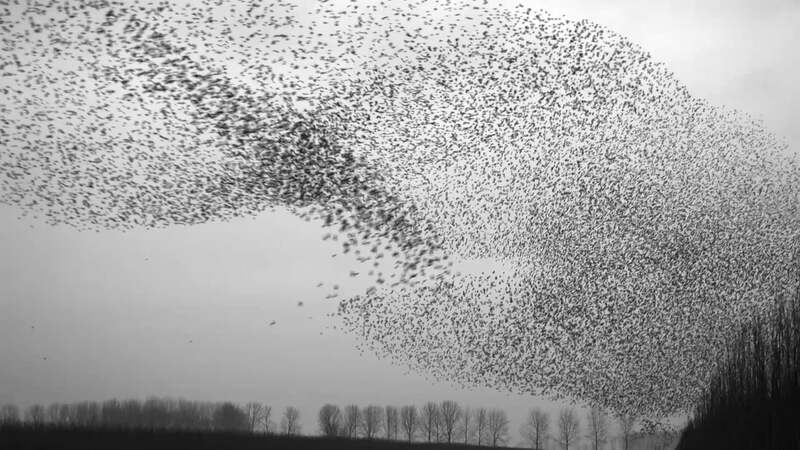 This two-minute excerpt from the Dutch filmmaker Jan van Ijken’s short documentary The Art of Flying follows a spectacular aerial performance from a massive, shape-shifting starling flock over an open field in the Netherlands. I’ve been brainstorming congeries particles / boids if you will, flitting askance — then, shaping / conglomerating into the forms of dancers. Its for a drawing, part of a small project on Isadora Duncan. Or say, whatever relevant forms (as particulate matter) doing the same towards creating a whole.All helpful towards realizing what I have in mind. Thank you. This entry was posted on March 16, 2018 by Vox Populi in Art and Cinema, Environmentalism and tagged A Murmuration of Starlings, Jan van Ijken, migration of birds, The Art of Flying.